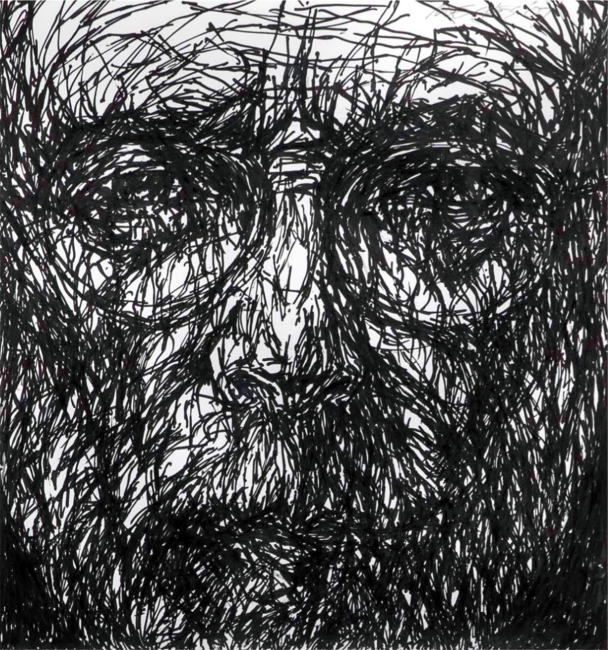 Arnold Mesches, Self Portrait 9 (2007, pen and ink on paper, 11.75″ x 11″). Keith Schweitzer of ART(inter) in conversation with artist Arnold Mesches during his current exhibition Arnold Mesches – 75 Years of Works on Paper, on view at Life on Mars gallery through December 20th, 2015. Arnold Mesches, Brushes (2010, acrylic on canvas, 80″ x 87″). KS: You were born in the Bronx but moved away as a child, spending most of your education and early career in California. When did you first come back to New York, and what was that like? AM: My first exhibition in New York, a solo show, was in the East Village at Civilian Warfare gallery during the 1980’s. 1984, I believe. It was kinda crazy. There were 15 or 16 reviews, in every magazine, every newspaper, quite a moment for me. During the opening reception, they had to close the street off, it was so crowded. I don’t know if you remember Civilian Warfare, but the gallery was pretty small. They hung 26 paintings! With so little space between paintings I was like, “Oh God, it’s so crowded!” They said, “This is the way we do it in the East Village.” So I figured, well, I may as well just go with it. Arnold Mesches, Anomie 1943: Halos (1992, acrylic on canvas, 80″ x 96″). AM: I was 61 years old. Nobody comes to New York at 61. KS: Well, you seem to break a lot of rules. Not one to follow the trends. AM: Not purposefully, it’s just the way I live. 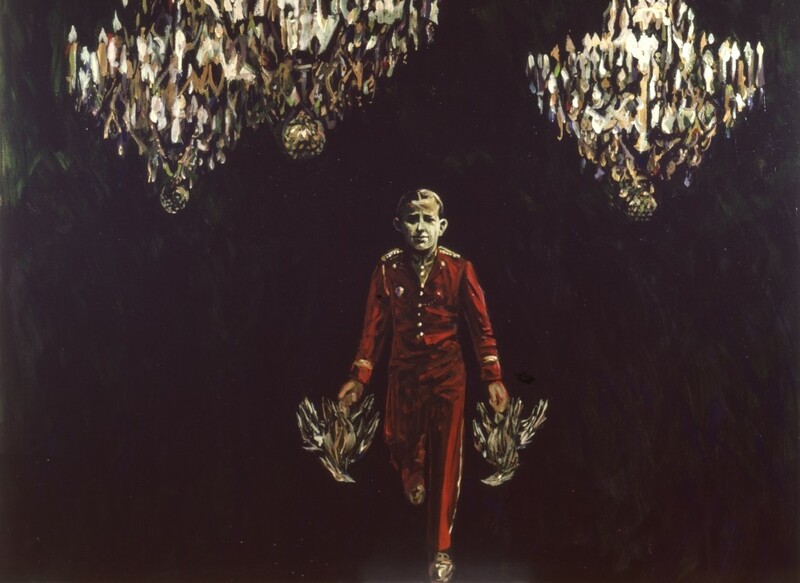 Arnold Mesches, Three Chandeliers (1987, acrylic on canvas, 80″ x 87″). KS: Let’s talk about your drawings. 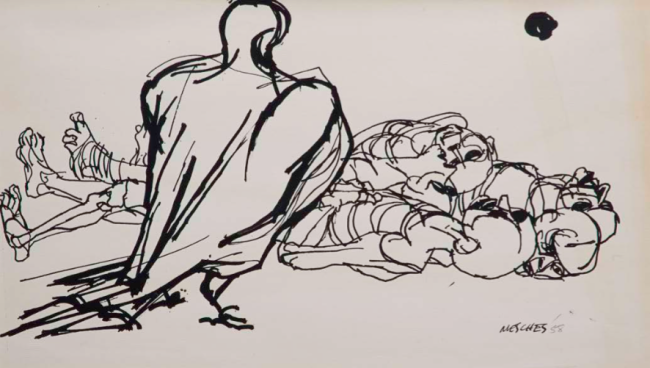 Are these drawings studies for paintings, or were they intended to remain drawings? AM: I work from my drawings. Sometimes they’re collaged together as I form compositions for paintings. So, many of my drawings were studies for paintings. Many others were intended solely as drawings. I was a drawer before I was a painter, and I’ve always used drawings as a way in which to get to things. And another thing is, when I’m stuck—and you’re always stuck at some point, or you finish a series—I just go back to drawing. Just sit there and make drawings, as a way to calm down. Out of it, things happen, they always happen. 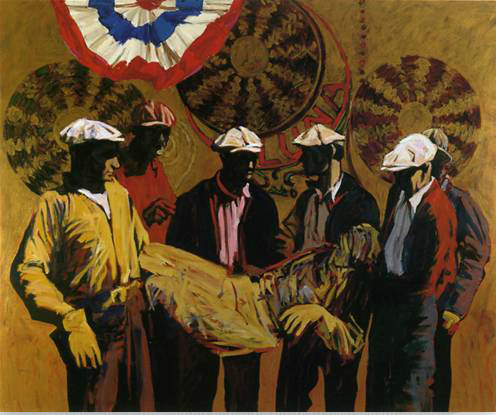 Arnold Mesches, Lead Soldiers (1996, acrylic on canvas, 70″ x 62″). 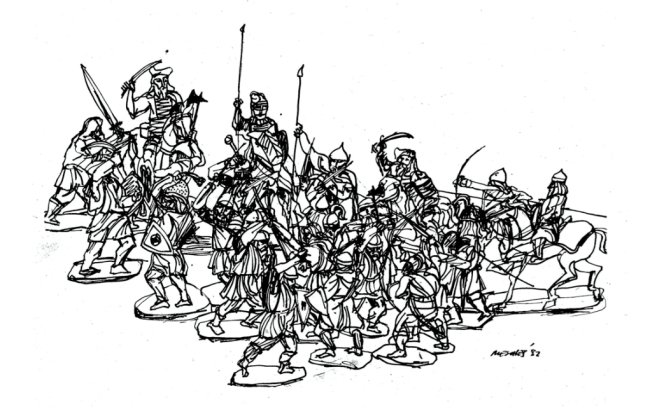 Arnold Mesches, Lead Soldiers (1982, pen and ink on paper). KS: For your current show here at Life on Mars it’s strictly drawings, from a wide timespan, 75 years. On one wall, in particular, there are selections from a series titled War Images. Can you speak about these? 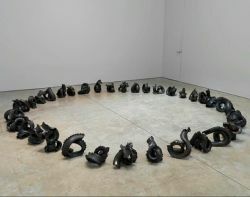 AM: There were 85 pieces in the series, we narrowed down to 27 pieces to choose from. Some of these became paintings later on. 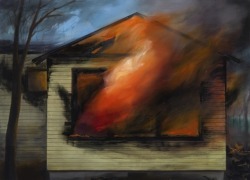 Some of these represent the culmination of three or four efforts as drawings. 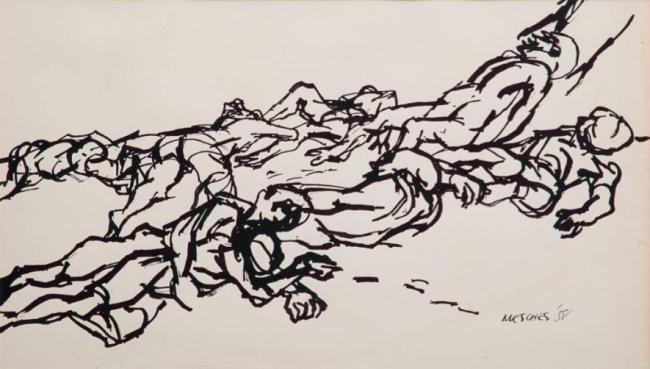 Arnold Mesches, Hiroshima Beach (1958, pen and ink on paper, 11″ x 19″). I was at a point where I had finished some things and, you know, what next? And I started thinking, in the Renaissance they had the Christ image, and that was the big story… What’s the big story of my life? And at that point it was the second World War, and the concentration camps and so on. That was the big story of my life, really. I lived through it, friends were killed. I figured, well, that’s going to be my Christ series, and I started making these drawings. And the crazy thing is, the bird imagery came into them by sheer accident. I had my sketchpad open and some birds appeared, and I just put them down into my sketches. As I made new drawings I began to put the birds in in different ways. Years later, a friend, Charlie, came over and said, “Do you realize that there were actually birds all over the concentration camps picking at bones?” The same thing happened with the doll imagery. I don’t control my intuition, I just go with it. At a certain point, it’s just in your DNA or subconscious, you are who you are, and you stand on it. At a certain point you become yourself. KS: You’re not very wasteful of line. Every stroke has a meaning and a surety. AM: That’s the most important, that every stroke has a meaning. And there can be thousands of strokes or just ten. 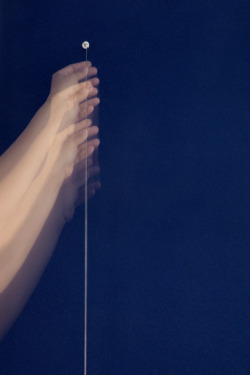 I need the line’s direction and its movement and its tension. The relationship, that one to this one, the way in which the movement goes as opposed to another movement. So, opposition has a lot to do with it, and I play with the back and forth. I don’t use erasers. The line that I put down starts telling me where the next one is going to go. I’m aware of the picture plane, aware of the space, always with a sense of opposition. I’m interplaying, trying to create tension with what’s left over in the spaces and and relationships with those lines with each other. The sense of its thinness to thickness, boldness to what is gentle. 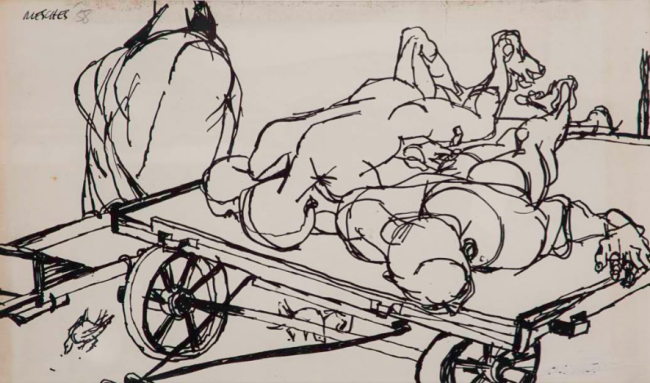 Arnold Mesches, The Cart (1958, pen and ink on paper, 11″ x 19″). KS: What role do politics play in your work? 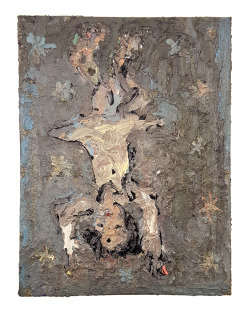 AM: Well, if you go back to my own generation there’s Leon Golub, and I have disagreements with Leon, and I have disagreements with people who are overtly political. 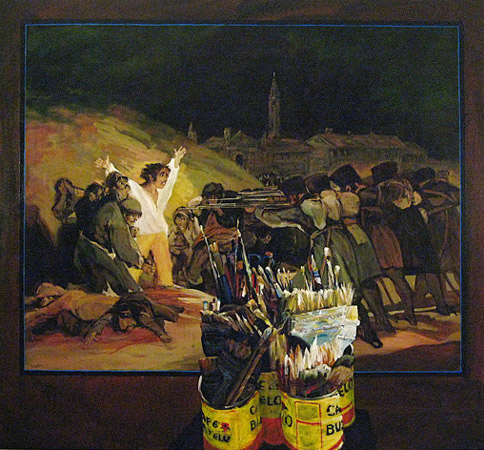 I don’t think art necessarily is a propaganda machine. I think the world is far too complex, and our lives are much too complex. There is such a thing as beauty, which is also as powerful, in some cases, as a thing that’s political. I mean a painting by Van Gogh of some flowers, what’s political about it? But man it’s a knockout painting. It’s gripping. And that, to me, is political. Because when you grip someone, and you influence someone, you are making a statement. That’s why art is much more complex than overtly political. When you look at my work, it’s a statement about my life, a statement about the world I lived in, now almost a century. You can know what happened in my life, in my century, from my work. The ‘how’ is just as important as the ‘what’, and it’s the combination of the ‘how’ and the ‘what’ that make art. That’s really what I’ve been after all my life. 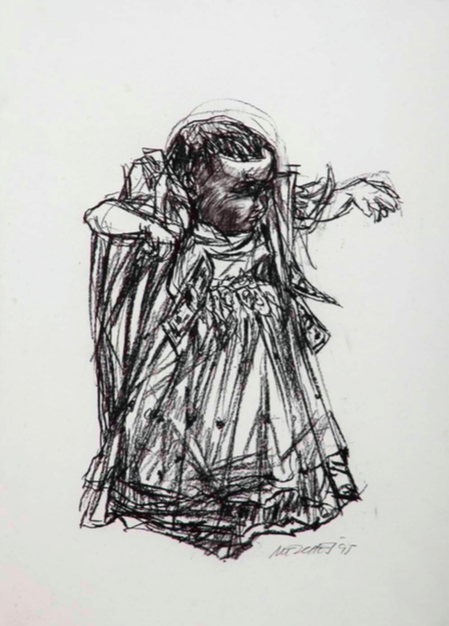 Arnold Mesches, The Contestant 10 (1995, pitt charcoal on paper, 24″ x 19″). 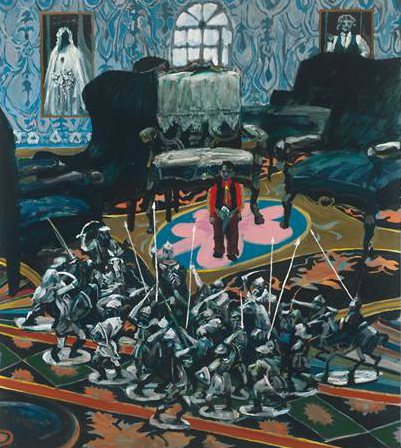 View more of Arnold’s work on his website, or visit his exhibition at Life on Mars. Arnold Mesches – 75 Years of Works on Paper is on view through December 20th.